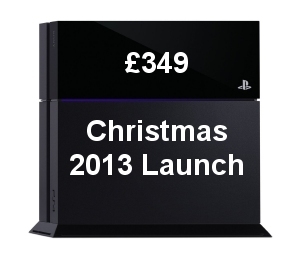 At the E3 Expo 2013 in Los Angeles Sony have confirmed that the PlayStation 4 will be launched in time for this Christmas with a UK recommended retail price of £349.00 ($399 in the United States and €399 in Europe). Significantly this makes the console almost £80 cheaper than it's rival the Xbox One. Gamers will also be attracted to the fact that the PS4 will not have the same restrictions on pre-owned games as the Xbox One which has caused widespread dismay amongst the gaming fraternity. PlayStation 4 games will be freely available to trade, sell them or lend to friends which also means the console does not need to be permanently connected to the internet. These points could potentially prove decisive in the next round of the video game console war between Sony and Microsoft. Sony have indicated that it will be a simultaneous worldwide launch but failed to give an exact date other than it will be before Christmas. These pointers along strongly indicate that stock shortages are higher likely in the run up to Christmas with demand far exceeding supply.